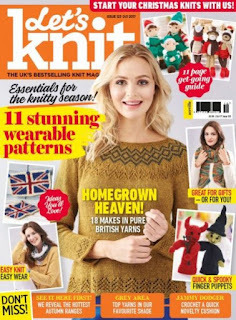 Have you seen the new issue of Let's Knit yet? 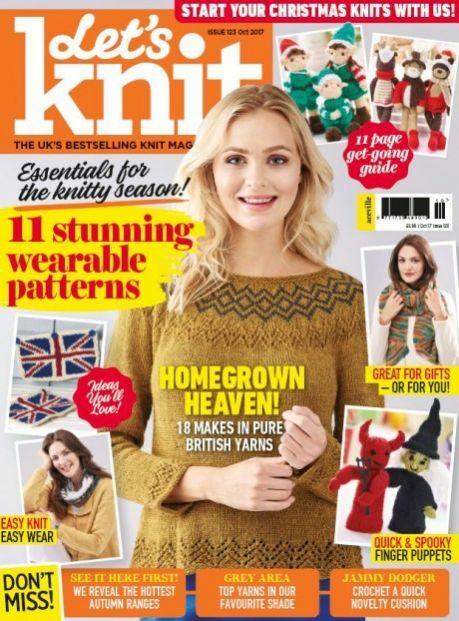 Issue 123 which is in the shops in the UK now has my design on the cover. Let's Knit says: 'We think Anniken Allis might just be the queen of stylish yoke sweaters! We love this striking design and the pretty lace details are an added bonus. This garment is worked in the round, starting with the body. You then set this section to one side while you knit the sleeves. Finally you join it all together on one circular needle and work the yoke, neck and shoulders.' There's no sewing up to do! This sweater was knitted in Baa Ram Ewe Dovestone DK which is a blend of British wools. This sweater has a simple shape and even if you've never knitted a sweater in the round you can do this! Just give it a go! 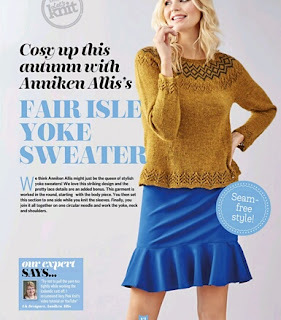 Both the lace and fair isle patterns are easy to knit. You can pick up this issue in the shops in the UK now.